There was a day when your popularity was much more ambiguous in social situations. It was harder to specifically point to what made someone popular or not popular. Popularity was often tied to how many friends you had, how cool those friends were, did you throw parties or go to parties, were you in clubs/sports/band, etc. In today’s reality we have something much different than the unspoken pecking order of popularity, it’s called your Yakarma score on Yik Yak. In this guide we will walk you through the meaning, how to get a higher score, some great tips to get you started, and an argument on “you be you” philosophy. Keep in mind, Yik Yak is a relatively new app and as time goes on, the developers will enhance the overall experience and may change the way they calculate or value your Yak Karma (Yakarma). We will try to continue to update this guide as needed when new information or new releases become available for the public. You may have landed on this article because you had heard people say their Yakarma was through the roof and wondered what that actually means and where that word came from. The word is based on the popular app that has been taking college campuses, corporate businesses, and friends by storm. It’s called Yik Yak. Yik Yak is a popular new social media app that is a great mixture of an anonymous online forum, mixed with a geographic group. The premise is that you sign up for Yik Yak and don’t pay anything and don’t even provide your email address, name, phone number, or anything. The app is completely anonymous and that’s part of the fun of it. When you open the app you are asked to share your location, which you must do to have the app work properly. Then, Yik Yak will find your location and build a “group” that is a 1.5 mile radius around you or 500 users, whichever is reached first. Then, you will be able to see anyone’s post within your group or area without having to friend them or follow them. You can also post messages that will show up to anyone in your group. The app is very popular among college campuses to share hot topics, what’s going on during the weekend, gripe about a hard exam, and tell a funny story about a late night encounters. You may even be lucky enough to find some PSL yaks from a BB. Now that you’ve gotten a good picture of what Yik Yak is, let’s move on to answering all your questions about Yak Karma, commonly known as Yakarma. First, what is Karma. According to Dictionary.com it is “Bringing upon oneself inevitable results, good or bad, either in this life or in a reincarnation: in Hinduism one of the means of reaching Brahman.” In this context, Yakarma refers to your one’s inevitable good or bad results depending on how they interact with the app. It’s a sort of measure on how popular you are or how good you are at the app. Your Yakarma score is a compilation of everything you’ve done in the app, posts, comments, reply’s and more. Below, we will cover a bit more about how to increase your Yakarma score and tips to remain on your game. As you can see above, this is my Yakarma score, I’ll show you below how to view it if you don’t already know. How Is Yakarma Score Calculated? In case you’re wondering how the score is actually tallied up and calculated. I’m hear to shine a little light on that. It’s actually fairly simple, and much easier to figure out than your Snapchat score or other scores on social media apps. First things first, when you download the Yik Yak app onto your iPhone or Android you won’t need to sign up or login because it is completely anonymous. However, since it’s a fresh download onto the phone, it will give you the base score of 100. Everyone starts off with 100. Of course, they could start everyone off with 0 or 1000, it doesn’t really matter what you start off with since everyone starts at the same place. It’s a psychological trick that let’s you think you’re not starting off from nothing and will decrease your likelihood of giving up because you have the mentality that you haven’t built up a high enough score yet. Now, below is the breakdown of how you get positive and negative Yak points. Yak Reply: + 2-6 points *Every time I reply I seem to get different number of Yakarma points added to my score. As you can see from above, you can get the most points for replying to posts or posting your own new content. That makes sense that Yik Yak would want you to post and reply more than upvote or downvote a post. Make note that you can get more points just by voting a bunch, so you can go through and upvote and downvote as much as you want to get more points and also to help boost up the good posts and move down the bad posts. Yik Yak Tip: If a Yak is downvoted to more than a total of -4 points it will be permanently deleted from the pool of posts and no one will be able to see it. This is a way for the app to have it’s users self regulate the good and bad posts and will make it easier to filter out those offensive or inappropriate comments or yaks. What is the Highest (Record) Yakarma Score? This is something I’ve gotten asked a lot, what is the highest score they’ve seen and what can be trusted. The annoying thing is that someone could easily Photoshop a score to make it look higher than it actually is, and therefore skew people’s opinions on what a high score actually is. In my experience, if you have a score of over 1000, you use the app a bit but not that often, from 1000 to 5000 points you use it regularly and reply and comment to other people’s posts. If you’re over 5000 points you are one of the heavy users that use the app pretty much every day. The highest score I’ve seen on a friends iPhone is 11,000. I’m sure there are higher scores but that’s the highest I can confirm on my own. Watch out for images or posts online that show a huge score, it could easily be that they have edited the score to make it higher than their actual score. If you have a high score, be sure to let us know in the comments below and whether you’ve seen scores that seem fake or not. You can increase your Yakarma score in a number of ways, as you can see above you get more points by posting yaks and commenting. However, you can also get more points simply by upvoting or downvoting a post. Here are some of the best ways to get a high score. First, the top advice I can give you is to simply use the app regularly and sustained. If you continue to upvote and comment and post on a daily basis you will get a respectable score by not even trying. The trick is to open the app when you have a quick 5 minutes to spare while waiting for a coffee, meeting a friend, sitting in a boring class, etc. Try to use the app regularly so that you get good at picking up what are popular trends and funny sayings. A good idea is to use the “peek” feature in the app to look into some other college campuses or more so that you can get ideas for funny yaks. Often times reading the top 50 list of best yaks will give you a better idea of what to write. If absolutely necessary, you can copy someone else’s yak and post it into your group. Try to limit this, though as you don’t really earn the points, it’s basically a form of stealing points. Funny or insightful yaks are easily the most popular. If you go to the hot tab in the app, you can see that the majority are college related and they are funny or insightful about an exam, dating scene, football, basketball, or social scene. Try to say what’s on your mind and create a funny scenario or saying. Make sure you aren’t offensive, if you are offensive on the app you will quickly get downvoted and loose a bunch of points in a hurry. It’s better to remain funny and truthful to yourself than try to get people’s attention by being offensive or mean. I end by focusing and harping on my golden rule: you do you. As with everything in life, everyone’s different, has different tastes, different personalities and popularities. The great thing about Yik Yak is that you don’t need to have 1000’s of followers to be heard, anyone can be heard no matter who they are, how popular they are in school, or if they have something good to say. The main thing I’ve found is that if people are themselves, others will respond to that in a positive way. Be confident on who you are, and your awesome personality will come out. Sure, there are some bullies on Yik Yak, but who cares, there are also people just like you on Yik Yak that can empathize with whatever you’re feeling and thinking. Speak your mind; you do you, and your Yakarma score will follow. You will be happy to hear that you can now transfer your yakarma score between devices. Previously you had to loose all of your yakarma score and you would need to start over. However, you don’t have to worry about that anymore and you won’t be stuck from ground zero without any yakarma score to show for all of your previous work and efforts. You can switch devices simply by making sure your iCloud is turned on if you have an iPhone and if you’re on an Android device just make sure you sync with your Google Play account. From there, if you login to the same account on a different device and download the Yik Yak app you will be able to see your original yakarma score that has followed you and is synced between your different devices. However, you won’t be able to be logged in to multiple devices at the same time. Therefore, when you login to the app, aka when you download the app since there is no login required, you will loose all yakarma on your old device. In other words, you can only have yakarma on one device at a time. 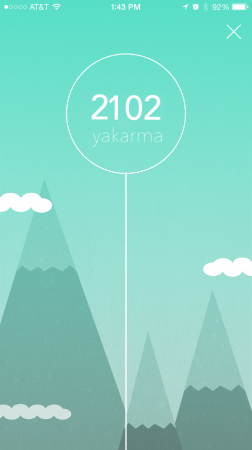 You can erase your yakarma score if you’re in a situation where you want to reset and completely restart on the app. You may be asking who would want to do this? However, if you for instance move from one city to another and want to get a representation of your popularity in that new city you can start fresh and get a new sense of how popular you are on the app. All you have to do is email the Yik Yak team at their support form. This form will allow you to write a message to the Yik Yak team and request that your yakarma be reset. There is no way to do it via the app unless you sign up for a different iTunes account and download the app on a different account. From my experience, they’re pretty quick about getting back to you and will be happy to help reset your yakarma score. Have any other tips or tricks related to your 2015 Yakarma score? Let us know what has worked for you and how high your score is. It’s always interesting hearing what various people’s scores are and how long it took them to get to that score. Some people seem to sky rocket in just a few months, whereas other people slowly build their score over the course of years. Which one are you?